Snowmobile to Finland, Sweden and Norway all in the same trip! On this high-speed adventure you can visit three Scandinavian countries in under a minute! The unique location of Kilpisjarvi makes it a perfect base for a bucket-list trip! Follow a scenic snowmobile route through snow-topped tree trails across vast frozen lakes, with plenty of photo opportunities along the way. You’re in pursuit of the large yellow marker, which marks the world’s most peaceful border. Stop to take in the absolute silence of the Arctic wilderness, and jump from one country to another! 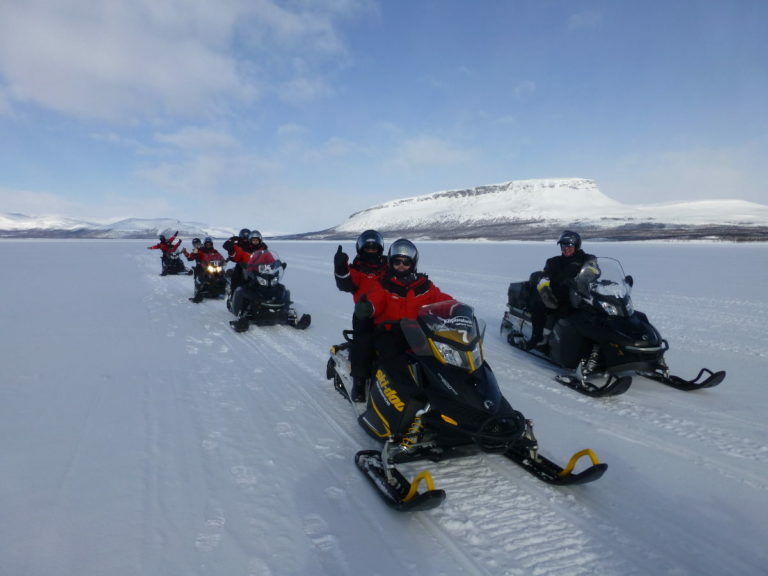 This is the perfect adventure for those who have never driven a snowmobile before, and those who prefer a more leisurely journey can hop in the large sleigh behind the snowmobiles, and relax as they take in the views!